The first of the three MBARI autonomous vehicles designed to document microbial diversity in the ocean arrived in Hawaii this week and will be deployed off the Hawaiian coast on Friday. Scientists and engineers at MBARI are working in collaboration with researchers at the University of Hawaii to develop a new ocean sensing and sampling system of autonomous underwater vehicles (AUVs) to better understand microbial processes in the ocean. 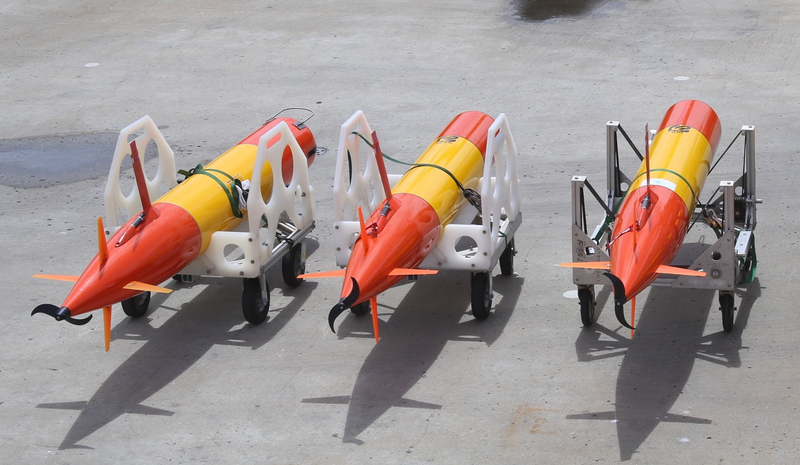 Earlier this year, MBARI engineers completed the construction and testing of three new long-range AUVs, which have expanded range and longer endurance than regular AUVs. In the future, each of these vehicles will carry an Environmental Sample Processor (ESP), an instrument that collects and preserves seawater samples immediately, capturing the native state of organisms’ genetic material and proteins. The three long-range AUVs Ahi, Aku, and Opah (in the center) on MBARI’s dock. These vehicles will be used to study microbial diversity off the Hawaiian coast. Because LRAUVs are very complex systems, MBARI Engineers Brian Kieft and Brett Hobson are assisting with this first deployment. They are instructing its new users how to pilot the vehicle and create missions in the ocean. When equipped with ESPs, the three vehicles, named Ahi, Aku, and Opah, will work in unison to address the challenge of sampling at different locations and depths faster than microbial communities and their environment change in time. 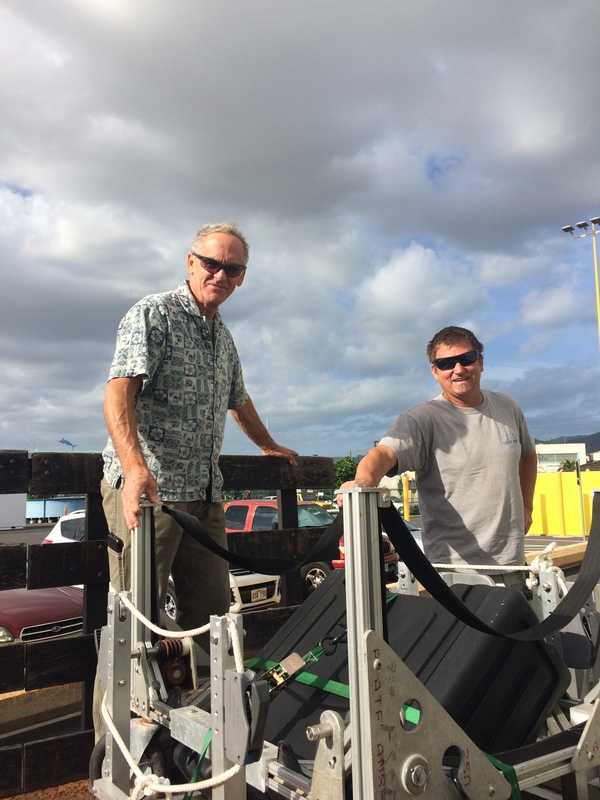 Opah, the first of the three long-range autonomous underwater vehicles (LRAUVs) to arrive in Hawaii, with University of Hawaii engineers Gabe Foreman (left) and Steve Poulos. 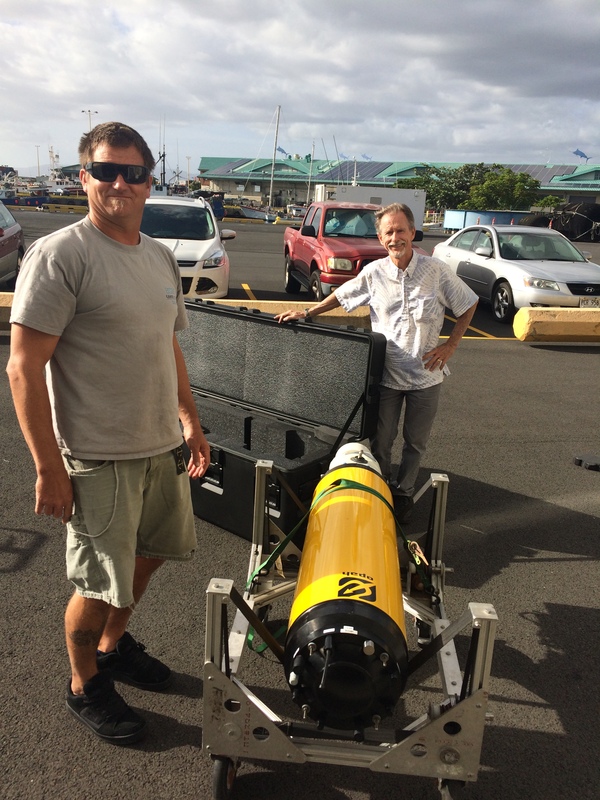 MBARI engineer Brett Hobson (left) and Gabe Foreman prepare for Friday’s deployment of LRAUV Opah.